Pizza by the slice is a common occurrence in the USA and Italy, but I haven’t seen it in more than a couple of places in Melbourne. Lievita in Northcote offers pizza by the slice but takes it a step further than the USA by allowing you to choose how big or small you’d like the piece to be. They use scissors to cut off the size you want and you pay by weight. It costs $35 per kilo, which translates to a very reasonable $10 for a piece roughly the size of a small pizza. The joy is that you get to try small pieces, rather than just one whole pizza. For a single food committment phobe like me it is the equivalent of pizza degustation. There is no problem choosing which pizza to buy, you can have it all. It also has the advantage you can buy as much as you need, rather than a set size. 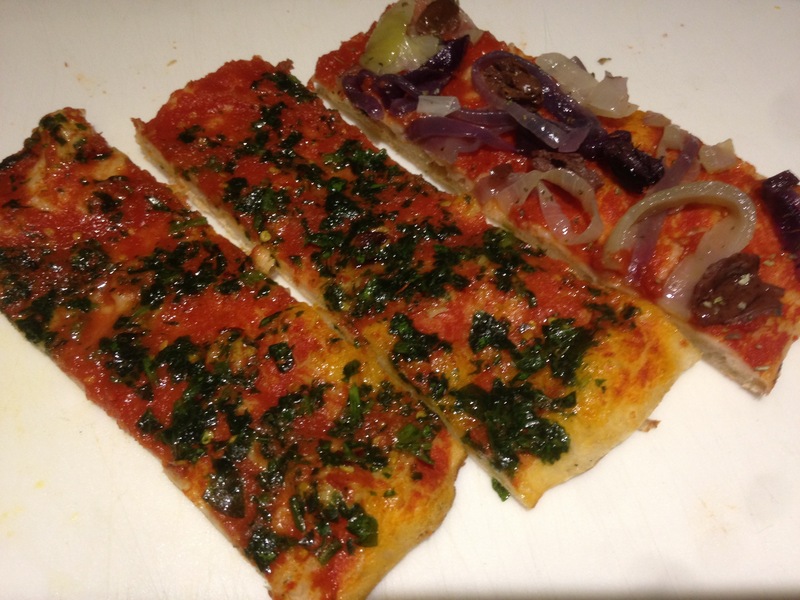 I chose the Marinara – Roman style with tomato, garlic, chilli and parsley and also a slice with cooked onions, olives and oregano on a tomato base. Both were excellent. On a subsequent visit I sampled the zucchini pizza which is just topped with grated zucchini and garlic. It was also delicious. Unfortunately I didn’t photograph it. You can have it heated up there, you can sit down at a few tables, but I think it is perfect for on the run, or to take home. There are five vegan pizzas on the menu. They don’t have all the pizzas made at any given time, but when I went they had five made, two of which were vegan. It is probably a good idea to check if the pizzas they have made at any given time are the vegan ones. I took mine cold and heated it up in the oven myself. It is crispy and delicious, and while it is not quite as good as a freshly cooked pizza, it is still very, very good. This is probably going to become a regular stop on my way home on a Friday night. This is great..never knew this place existed!!! Thanks!! oh wow! New place to check out!